Omahuta Forest was logged from the 1880’s until the middle of the 20th century, with wind thrown trees removed for their timber after a cyclone in 1959. Eight years earlier a small 6 ha sanctuary of exceptional trees was created, with the largest given the name “Kopi”, after the New Zealand Forest Service officer in charge at the time, a Mr Corby. Kopi was the largest tree in the sanctuary and considered by many to be the best kauri tree by combination of girth, height of bole and overall height. 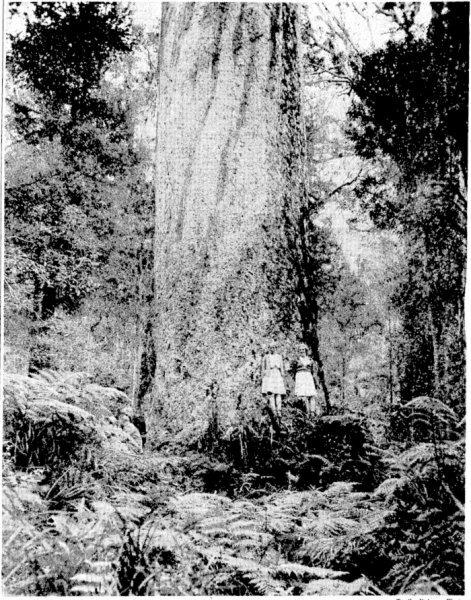 At 212 cubic metres total merchantable volume, it was ranked the third largest kauri in 1971 after Toronui (NR/0805) and Tane Mahuta (NR/0800) and ahead of Te Matua Ngahere (NR/0802). In 1973 a storm felled the tree, revealing it to be hollow inside, a literal shell of its outer size and splendor. A colony of lesser short-tailed bats (Mystacina tuberculata) or pekapeka-tou-poto was found living inside. 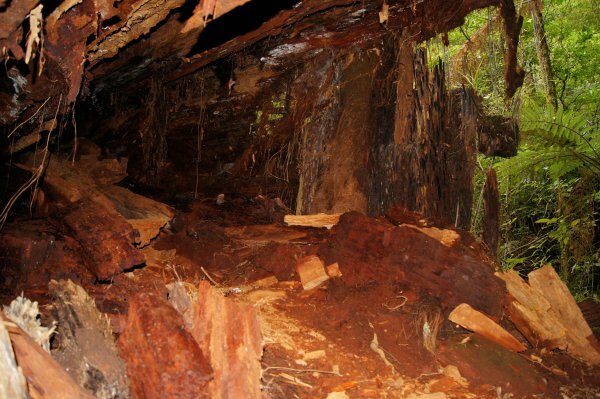 The fallen log can be seen as of 2016, although almost unrecognisable, so obscured is it by regrowth, at the intersection of the loop track around the sanctuary and the short spur track leading to the Hokianga tree (NR/0803). Some images of the tree, taken before it fell can be seen at the Auckland Library website, and an account of a visit soon after it fell is here. The stated height of the tree of 56.7 m (186 ft) is probably an over-estimation due to the limitations of the methods of the time of measurement in 1971. Other trees in the sanctuary, and other large Kauri tend to have shorter heights than the official NZFS measurements from 1971. An account of the tree in Reed describes the crown spread as "6210 ft…somewhat less than Tane Mahuta”. A circular crown area of 6210 square feet corresponds to an average crown spread of 27 m, indeed "somewhat less than" Tane Mahuta’s 38 m.
 S. W. Burstall, “Historic and Notable Trees Northland and Auckland, Mensuration Report No. 16 (Unpublished),” 1971. A. W. Reed, The New Story of the Kauri, 1964. Abney levels and hyposometers were typically used at the time of measurement, but could be inaccurate on the large spreading crowns of kauri. Hollow at time of falling. 01 Jan 1971 Burstall, S.W. Puketi and Omahuta forest is easily accessible from the Hokianga harbour and the Bay of Islands. You can access Omahuta Kauri Sanctuary from State Highway One. It is signposted a few kilometers south of Mangamuka Bridge. The track is signposted from the car park at the end of Sanctuary Road. It takes 30 minutes to walk the 550m track. The fallen log is visible at the corner to the unmarked track to the Hokianga tree. It is very important that you keep to the walking track at all times. 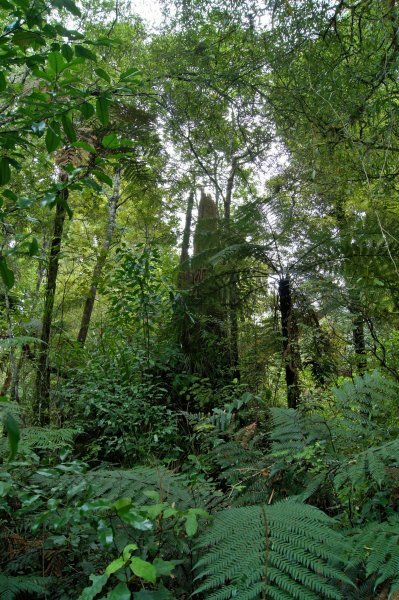 kauri have very sensitive surface roots, and foot traffic around the trees endangers their life span and may potentially spread the PTA disease that is threatening them.